HeritageBooks.com is having a Midnight Madness Sale starting September 26, 2008 and ends October 3, 2008 at 12:55 am. Craig Scott is celebrating Heritage Books 30 years of selling books to genealogists. It is sort of like an online Birthday Party, where you get the present – 30% discount off everything published by Heritage Books! Start your Holiday Shopping early, add to your collection, and buy a few books to donate to your local genealogical society. Other items for sale are Maps, DVD/CD’s and Educational books. There is also help in publishing your own book! Order a catalog to be sent by mail right to your mailbox! Please email at orders@HeritageBooks.com with your name and address. Already know what you want to purchase, or just need to look for one or two items? Go to http://www.heritagebooks.com/mm5/merchant.mvc?Screen=SFNT&Store_Code=HBI and use our search capabilities to find your items easily. Don’t want to wait? Download an Adobe format copy of our catalog: HeritageBooks.com/catalog.pdf. Be sure to sign up for our Free catalog to be sent to your mailbox as well, so you never have to miss out on new publications of interest. · Online: Use promotional code MIDMAD08 to receive your 30% off your total, before shipping. · First, For the Duration: The Story of the Eighth (8th) Alabama Infantry, C.S.A. Visit Heritagebooks.com and see if they offer the books you need. If not, email them and see if they can’t locate and order the book for you. Take advantage of this wonderful opportunity and stock up on your genealogy books! Over the last couple years, I have met genealogists world-wide through conference presentations, genealogy research, and common interest to help one another in our search for ancestors. The focus of this email is simply to let you know that a new and exciting genealogy website will launch in the fall of 2008. MyGenShare.com is a world-class website designed to provide genealogists with how-to resources. MyGenShare.com has been two years in the planning and development. You’ll find hundreds of knowledge-based articles, podcasts, and videos to help genealogists with their research. What am I asking of you? 1. Please register your email to receive the announcement when my GenShare.com launches. In addition you will be given free access to free premium content. 2. Please share the news that MyGenShare.com is coming with others you think will have an interest. My Ancestors Found has a brand new name! research. These have become known as Family History Expos. tech to trace your roots. considered for an Expo. Your feedback is welcome. has changed, you will see a lot of familiar faces! We need YOUR help! In early December 2008, an outstanding new book on the history of Shelby, Fayette, and Tipton counties in Tennessee, Crittenden County, AR and Desoto & Marshall Counties in MS will be published. WE MUST SELL SEVERAL HUNDRED COPIES OF THIS BOOK, pre-publication by Thursday, September 25, 2008, in order to ensure publication and delivery before Christmas 2008. This will make a GREAT gift idea! If we do not sell a sufficient number of copies pre-publication, the book will not be printed. In the event that we are unable to go to press, your Check will be returned to you. AND MANY MANY MANY MORE FAMILIES! IT IS VITAL THAT ORDERS & CHECKS ARE RECEIVED BY THURSDAY,SEPTEMBER 25, 2008. THANK YOU!!! Please help us get this great book to print!!! Thank you! Here is the TN Genealogical Society’s upcoming schedule. Why not share yours? Germantown Library Associate Jennifer Baker and our own long-time librarian Loretta Bailey will teach us how to get the most out of the books and documents in the library stacks. Free and open to the public. This class will cover the basic use of FTM 2008. How to enter data related to your family and how the family tree is constructed in the computer database. The most important task is how to maneuver within your family tree without getting lost. This course is NOT intended to make you an expert in the use of FTM 2008. Free and open to the public but registration is required (call 901-757-8480). Vincent Clark of the Shelby County Archives will talk about the relocation of the Archives to Shelby Farms and update us on the latest genealogical resources on the Archives website. Free and open to the public. The material covered in this course will show you how to do many of the fundamental tasks you must be able to do with your computer. One of the most important topics will be the understanding of the Filing (Folders) system used in computers including how to create, name and delete folders. We will discuss topics such as copy, cut, paste, and move. A more detail coverage will be covered in a following class along with limited hands-on practice. Free and open to the public but registration is required (call 901-757-8480). Author Judy Ringel will talk about early Jewish families in the Mid-South. Free and open to the public. Dr. John Harkins will read from his new book and will autograph copies that will be available for purchase. Free and open to the public. In this course we will go into much more detail on how to do the many tasks such as copy, paste, cut, delete, rename and creating files. This will be a “Hands On” class where you will be able to perform many of these tasks on a computer. Practice on using the internet and downloading information and files from the internet to your computer. Participants are encouraged to bring in their personal computer laptops for use in class since the number of classroom computers will be limited. Actual hands on experience will depend on the size of the class. Free and open to the public but registration is required (call 901-757-8480). Seminar presented by TNGS members—Topics include Migration patterns to the Mid-South; Researching your Female Lines; and DNA in Genealogy. – Open to the public; registration required. Additional details will be posted on our website as they become available. This carnival is a “Show & Tell”. 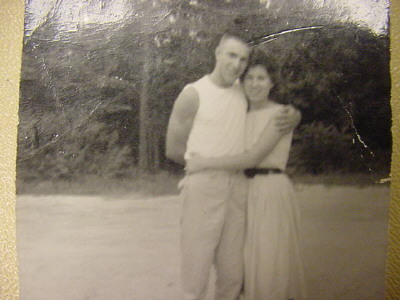 I have chosen a picture I found of my mom (Betty Helen Roaten Smith McKinnis) and dad (Marlow Roger Smith) about a month before they got married. This puts the photo taken about May 1960. I was even told this may have been the dress she was married in. The photo was taken in front of my dad’s house in Booneville, Prentiss County, MS. Although they are not presently married, they are still best friends and they frequently double date with their new spouses. I was born in May 1961, so almost a year later from the time this picture was taken I came into the world. Yeah…. This is the only picture from that time that I know of that has them together. I am so happy that I found it. The Bureau of Refugees, Freedmen and Abandoned Lands was established by the War Department on March 3, 1865. Its primary function was to supervise all relief and educational activities relating to refugees and freedmen. It assumed custody of abandoned or confiscated lands or property in the former Confederate States, border states, District of Columbia, and Indian Territory. The National Archives gives us the following information: “In the years following the Civil War, the Bureau of Refugees, Freedmen, and Abandoned Lands (the Freedmen’s Bureau) provided assistance to tens of thousands of former slaves and impoverished whites in the Southern States and the District of Columbia. The war had liberated nearly four million slaves and destroyed the region’s cities, towns, and plantation-based economy. It left former slaves and many whites dislocated from their homes, facing starvation, and owning only the clothes they wore. The challenge of establishing a new social order, founded on freedom and racial equality, was enormous.